Lunar New Year is coming up soon, we here at Battle Arena has already prepared some celebratory fun! ▪Free Gaming – To thank all you members for the support for the past year, all members can play for free on 3rd Feb 2019. So do come early to reserve your seats! ▪Monopoly Mania – Our F&B Cafe will be officially open that day! Win all kinds of free food and beverages prepared by our very own chef here at Battle Arena Café through a fun game of Monopoly.There’ll be loads of delicious food to be won! 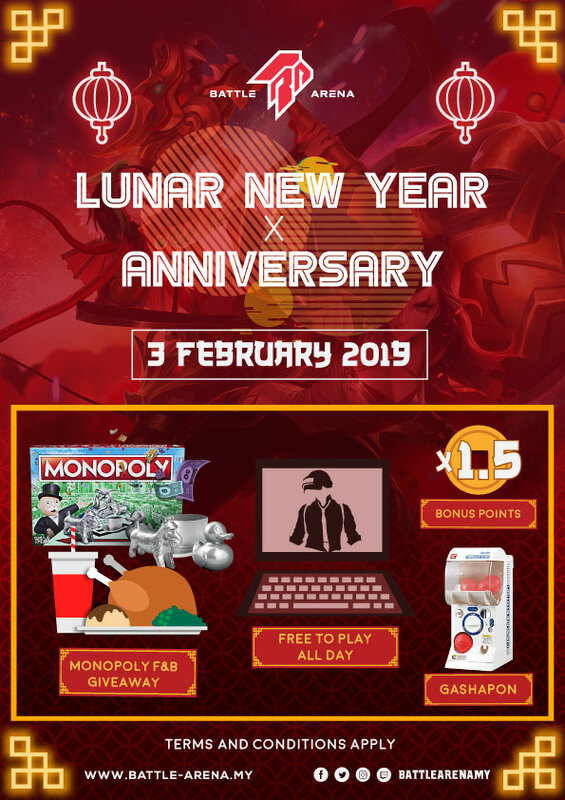 ▪150% Bonus Points – If you reload any RM30 on the February 3rd, you will be getting an extra bonus 50% gaming credits! Do not miss this special value top-up! ▪New Year Gashapon – with a minimum top up of RM50, you’ll stand a chance to win attractive prizes from our Gashapon machine. We’ll see you @ Battle Arena on February 3rd, 2019!